Devatha Fabrics, which started out as a wholesale business for pure silk sarees is probably the only institution in the region that has a 100 year heritage of dealing in silk to its credit. 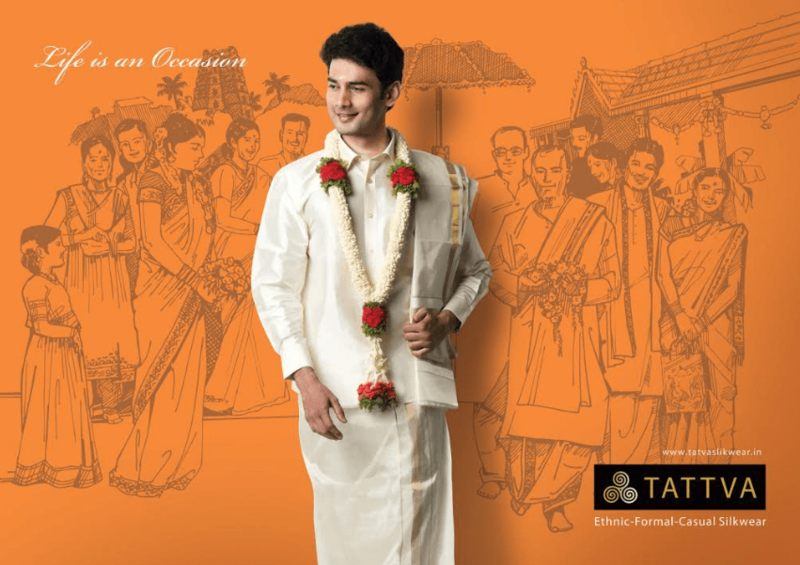 After concentrating on sarees for a little over two decades, the company noticed an opportunity in the high-end men’s wedding wear segment and launched Tattva that is now available at over 200 retail outlets in South India. Sriram Devatha, Managing Partner, Devatha Fabrics tells us more in this exclusive conversation. You have a 100-year-old heritage in dealing in silk – how do you look back at this journey? According to us being a 100 year old company and sustaining in the same business for 100 years is a big achievement on its own. The main reason of Devatha Fabrics for surviving 100 years is our focus on quality. Any product that we manufacture goes through quality checks and even our raw materials go through rigorous quality checks. This core value has been passed on from one generation to another. We filter many suppliers and work with only suppliers who provide quality raw materials. Many of our suppliers have been working with us for a few decades. Another point of survival is that Devatha Fabrics used to introduce new products frequently to cater to the consumer’s taste that used to change very often. Devatha Fabrics has been known in the market for innovation, starting right from innovation in the fabrics that were used and also the designs themselves. We were pioneers in branding sarees in the wholesale industry in the early 90s and the late 2000s. Branding sarees at that point of time was not heard of and we took a big risk in doing this that time and it worked very well for us. The brand was called Peacock silks and became a pan Indian sari brand. How has perception towards silk fabrics changed over the years? Silk for many centuries was used by the royals and the aristocrats in the form of clothes, carpets and other forms of home décor as well was the symbol of prosperity. In India men, women and kids used to wear clothes made out of silk fabric. But over the years in India silk was being associated only with women’s clothes and even in women’s clothes it was mainly associated with sarees. Recently this trend is changing and more men are interested in buying silk apparel especially for occasions such as weddings. Many brands are working on promoting silk clothes suitable for men and it is getting very popular. Silk has always been known to be a fabric that can be worn only in the cold season, due to which people avoid wearing silk products in the summer. The fact is that silk actually keeps the body cool during the summer since it’s a natural fibre. Brands are educating the customer about this property of silk and the customer started purchasing silk products for the summer too. This has been seen in our business since our biggest market is all of the South Indian states (which experiences hot weather throughout the year). Your new brand- ‘Tattva’ is into men’s ethnic clothing, was it a conscious decision to expand into this category? About five years back when we were still wholesalers in silk sarees, we were looking at other avenues to diversify our business. We wanted to work with silk as our base. We noticed that there were many labels who were manufacturing silk shirts for men and these shirts were being sold in many family stores in South India. The consumer at that point of time used to purchase a product that was recommended by their neighborhood family’s store salesmen. We saw a big gap in this business and realized that once we make these same shirts under a brand and market it the consumer may does not have to rely on the salesmen’s recommendation. We did continue our saree wholesale business for 3 years after starting Tattva by Mark Anderson. 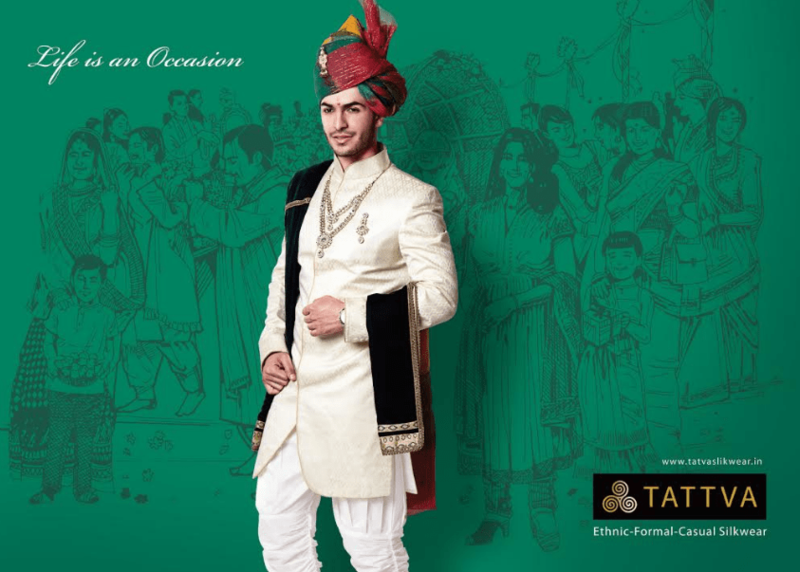 But once we started making more products in wedding apparel for men, we realized the potential in this market and we decided to make Tattva our primary business. Which export markets are you targeting and why? Please share details. In the near future we are looking at expanding in Sri Lanka, UK, Malayasia and Canada. We have noticed that the Tamilian’s in these countries like silk shirts and kurtas and we are already exporting a good number of pieces to these countries. Since there is a good population of Tamils in these countries, there is a ready market available for us to service these markets. What is the significance and value of silk in men’s clothing? In India men’s wear has a very limited number of options when it comes to fabrics that are being used to manufacture apparel. It is mainly cotton and linen for the shirts and for ethnic wear the main fabrics that are used are cotton and polyester silk. Linen for the weather in South India is no doubt a comfortable fabric to wear but for weddings and other special occasion’s linen is not a good option because of the characteristics of the fabric, in a short while the clothes have a huge number of creases and it looks untidy. If you wear a cotton product, you are no different from any other guest at a wedding. People like to stand out in an occasion especially of that of a wedding, if you wear a cotton product you the other guests also wear cotton. Wearing clothes made out of Pure Silk fabric makes a person stand out at a wedding due to the fabric’s sheen and richness. Art silk also known as polyester silk is a complete substitute for pure silk fabric, but since it’s a manmade fibre it is very uncomfortable to wear. Please tell us what makes ‘Tattva’ unique? Tattva is known for its simplistic designs that highlight the fabric being used. We try and replicate the clothes that were worn for traditional events many years back but with a contemporary twist to it. A good example of this is our silk stitched dhothis. These were worn by many south Indians for weddings but since it was difficult to tie these dhothis the trend stopped and people started wearing other outfits for this occasion. We got these dhothis back where the person need not tie the dhothi they just need to wear it like a pant. This product has become very popular since the generation these days want to get back to their cultural roots. How do you plan to target of a turnover of 100 crores over the next five years? What portion of this will come from exports? Apart from our silk wedding collection, which is worn only for the auspicious part of the wedding, we have also introduced another range of ethnic wear that is our fashion line. These products can be used for other wedding functions like the Sangeet and haldi. We also introduced a range of cotton kurtas which is the pre wedding wear and these kurtas can also be used for other occasions like pujas, temple visits and festivals. We introduced a collection of boys’ ethnic wear in silk and cotton fabric 6 months back and it is getting popular. In May, we plan to launch our women’s collection. In a short period of time we plan to launch our own exclusive stores with all the collections being showcased. With this I think we can reach our target of 100 crores in 5 years. How has this new venture enabled you to be a one stop shop for ethnic wear for the entire family? 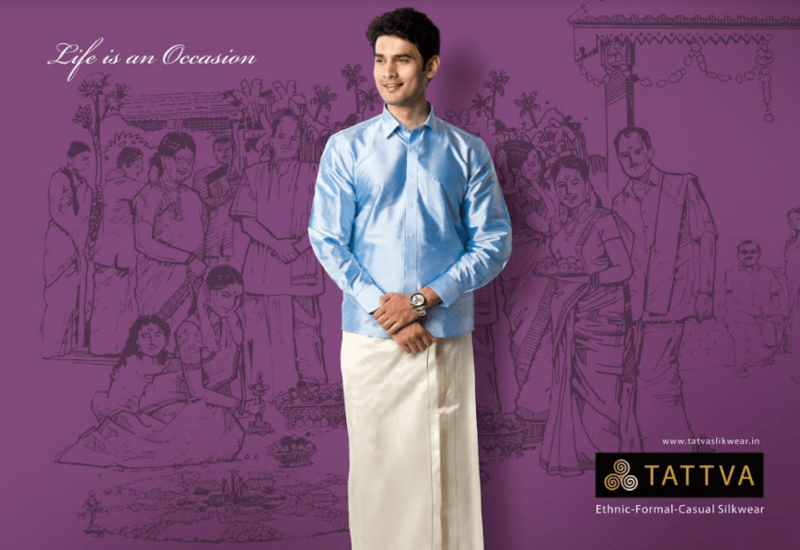 Tattva already has a wide verity of men’s ethnic wear and we are constantly adding more collections. We have released a collection for boys ethnic wear recently and May we would also launch our women’s (it will include girls too) ethnic wear collection. Since silk is a fabric that can be used for men, women and kids apparel, we can defiantly be a one stop shop for the whole family. Previous Previous post: Travel Gear – get your suitcase ready for a holiday! Read your article craft of coffee..Its of great help for me to brew coffee differently. U writes blogs on tour & travels.we need some guidelines for our bangalore trip in the last week of April.can you please help us. Sure I can give you a guideline depends on how long you are here in Bangalore, there is a lot to see and experience. http://www.bindugopalrao.com/wp-content/uploads/2016/09/109-Explore-48-Hours-Bengaluru.pdf will give you a good start but am happy to give you more details. Let me know and have a great trip to Bangalore!